The goal of the game is to get the ball to the goal. To do this you have to build a machine with the parts you get. The game is physics based and uses my physics engine ExtremePhysics. Edited by Maarten Baert, 16 August 2010 - 10:04 AM. Edit: wow, this is amazing! Very polished gameplay and amazing physics . I like how much you thought it trough, how you can attach joints before you take the object out of the box. Brilliant. Edit: after a longer play through, it feels like this game could benefit from some kind of pause button, it can be a little tedious in the later levels. Edited by theludicrous, 16 August 2010 - 09:14 PM. Hey, great project here; I am truly blown away by this! I decided to try to play it again and now I'm stuck on "motor"
I think the hardest two that I have done so far are the "bridge" and the "motor"
I figured out motor and bridge pretty easily but i don't see how to beat "maze", and it's like the 4th level, lol. it would be nice to freeze the physics to make building easier. sometimes i want to attach a beam to something, but it's hanging off the bottom of the screen, if the tool box was to slide in and out then it would be easier to attach a bolt to the end of it. Edited by Brother156, 20 August 2010 - 01:46 AM. I had trouble figuring how to build stuff. You should specify in the help to click a bolt first in the inventory then click a hole on a beam in the inventory and drag the whole thing to where you want to anchor the bold and beam on the play field. Anyway, These are my favorite kinds of games. I am stuck though. I cant do Stairway, Frozen Motor and Elevator. They all probaly use a concept I have not though of, concepts that should maybe have been introduced beforehand on easier levels. I am terrible at this game. So far I can only do Hanging, and I've been at it for about half an hour. I gotta keep going, but it's a little non user friendly. Bolting things is really annoying and so is positioning the bars correctly. There are many ways to do Frozen Motor, if you solved Motor you can solve this too. The idea is the same, but you have to use a second beam as a lever. Alternatively you can use the motor to build some kind of catapult. It's very hard to reproduce though . Thanks, but I messed up. It wasn't "frozen Items" it was "more items"
Elevator is actually incredibly easy if you know how to do it. My solution uses just 5 parts. Thanks I'll give it a shot. Incredibly easy you say? Edited by icuurd12b42, 20 August 2010 - 01:56 PM. Edited by Brother156, 20 August 2010 - 02:29 PM. heres what i did for Maze for those that have trouble. Edited by santa22, 21 August 2010 - 08:34 AM. Made it to "Go Up". Edited by icuurd12b42, 22 August 2010 - 03:16 AM. I'll give you a hint: My solution uses 2 beams and 3 rods (no bolts). Well, I've done all but vertical catapult. All my solutions. I feel prety good now. Marteen... You have a twisted mind. Good for designing puzzles! I've just uploaded a new version, now gravity is disabled while building. This should make the building phase a lot less annoying . The save files are compatible with the old version, so you can just copy the 'save' folder to the new version (or overwrite the executable and the 'data' folder) to continue. EDIT: I've found a bug, the antigravity blocks acted like normal blocks. I've fixed this now, but anyone who has downloaded the game between 6:00 PM and 11:10 PM (GMT+2) should download it again. Edited by Maarten Baert, 28 August 2010 - 09:27 PM. Ah, this new update helps a lot, I have beaten all the challenges! I'm stuck on the 2 levels with springs, spring and catapult. I did all the other "easy" levels fine. Edited by petenka, 26 September 2010 - 07:43 PM. Attack of the Jelly - A game about (oh, the horror) strawberry jelly! 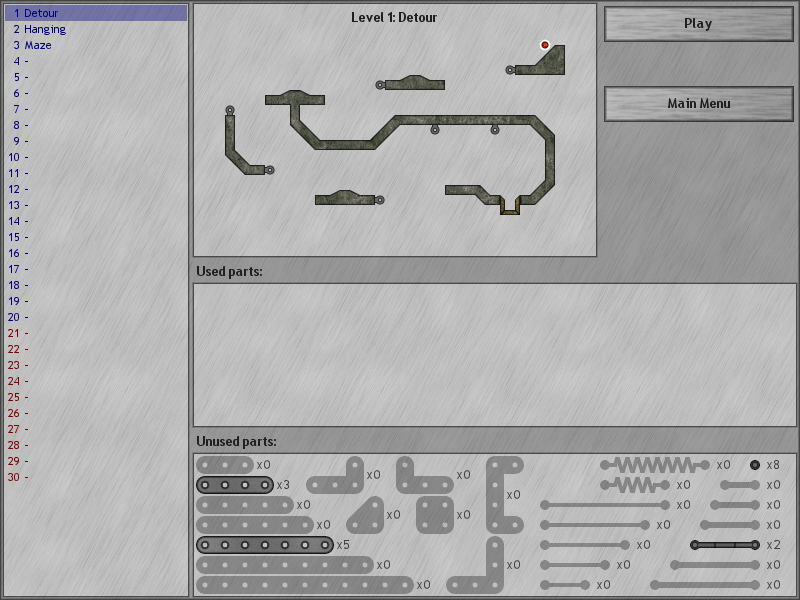 Math Based Platformer Engine - The best physics for a platformer, ever. Realtime Dynamic Fog - For realistic environmental effects. Windy Snow - The best snow in all of gmc. I solved everyone but the last two. They're definitely possible, just really really difficult. right ball, freefall + bank shot into bottom door. Edited by icuurd12b42, 29 September 2010 - 03:44 AM. 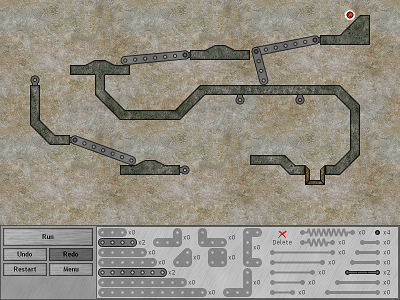 and I added some beams to delay the middle ball, and lots of beams to delay the right ball. My original attempt was like that... I just could not position things properly. So I thought the logical evident method your say here was a trap solution. Definitely tricky to beat but now that I've done the hard levels the easy ones seem, well, easy. I've played this a few time and I'm more amazed each time. Your physics engine (extreme_physics) is fantastic. This really should get more attention. I'm going to show you a video just how much I pwn ya all! 1 part: Go up, Minimal, Frozen Item, Lol u died. 2 parts: Items, Frozen Motor, Spring, Vertical catapult, Critical Timing. Edited by Qon, 18 December 2010 - 12:12 PM. It is rare to find a strategy game that allows for so many diverse solutions to each puzzle. Baked05(WIP): prerender lighting and shadows in 3d, bake in transforms. Unwrap light to texture. Topic. This is one of the best puzzle games I've ever seen. I would buy this if it wasn't free! Edited by Mysteria9, 08 April 2011 - 06:46 PM. This is a great puzzle game. Haven't made it past the first level yet but it will be fun and challenging. I can see I'll be spending many hours on this in the future. I also downloaded extreme physics. I can think of a number of game ideas where this will be an added bonus. thanks for both. Check out my new line of computer games. For poetry to lighten a troubled heart, check my poetry page. I've actually managed to get to level six! Doubt my solutions are the easiest or use the fewest pieces but I've solved them. I am looking forward to playing this game to the very end. Excellent game! When I get time to work on the game ideas where extreme physics will be used, I'll PM you. From what I've seen in the Machine, there are several things I've wanted to do that I'll now be able to do. Thanks for taking the time to make both The Machine and Extreme Physics available to play or use. Is it possible to see the source code for this game Maarten? It would help us massively for our university project. It is similar in principle: create a course using objects but in our case the ball is launched in a direction that the player chooses to get it into a cup. Your interface is just what we need as well! I don't really mind releasing the source code - in fact I've been thinking about doing this for some time. However, I don't think it's right to use this for a university project. There's nothing wrong with copying code from open source projects (or just figuring out how they work so you can use the same method), but it's not something you should do for a university project, IMO. After all the goal of these projects is to allow students to show what they are capable of. You can use things like scripts or libraries to make your life easier - there's no need to reinvent the wheel - but if your project is about creating a game, you shouldn't be using the source code of another game. I would consider that cheating, even if you're just using the code as reference material. 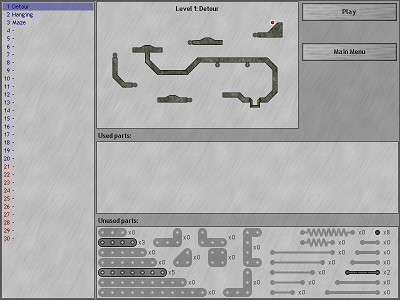 Besides, if you are indeed a beginner, don't you think a game like this is a bit too complicated for your first game? Creating The Machine was a challenge for me even though I've used GM for many years. Even if you have lots of experience programming in other languages, it will still take a few months just to get familiar with GM and all its weird quirks. I think you should really start with something less complicated. Absolutely ingenious! I love the game, its challenges and the idea. Not too much color but, you made me love Mechano. Very well made. Down point: When placing an object, you can't go through walls, you need to move arround them which is a bit tiresome but that's minimal, the game and interface is really well made and professional. Elevator: 0 parts? What do you mean 0 parts? 0 parts is leaving the level as it is, which I'm pretty sure doesn't finish the level I did it with 4 but I'm sure there's room for less. Go up: 1 part... go ahead, show that video. That bloody level took me 10 parts. Frozen item: 1 part - yep, that one's pretty easy. Just block the way. Items: 2 parts - are you sure you don't mean 3? You really need one part to fill the second gap (first gap is filled with big item), and two to fill the last gap. Frozen Motor: 2 parts - that's crazy. I did it in 5. I guess you actually used that motor. With 2 parts and motor I get stuck on that static gripping thing. Spring: 2 parts - 3 here. Maybe it's possible with a lot of work, but I just can't get the ball to bounce harder. Vertical catapult: 2 parts - Did it with 5. I give up on this one. Critical timing: 2 parts - Nah that's impossible. Catapult: 3 parts - Neat. I bet you worked hard at it. I gave up at 4. Other low-cost levels: More antigravity in 2 parts, more items in 1, another frozen item & motor & antigravity catapult in 1 (but that's easy). Brilliant game by the way. Edit: Finally got frozen motor working with 2 parts. Thanks for claiming it's possible. Edited by ramses12, 14 September 2012 - 12:33 PM. Well 0 parts is possible. 0 parts means that the end screen shows 0 parts used. As simple as that. Nether qould I. My ball basically doesn't bounce At All. But it is still possible. Edited by Qon, 16 September 2012 - 02:39 AM. Youtube? :P Try VirtualDub, it's a good tool for video editing, way superior to MovieMaker. Also CamStudio might be a solid rival to Fraps. From experience, video recording software tents to differ in behavior from one PC to another. >> Well 0 parts is possible. 0 parts means that the end screen shows 0 parts used. As simple as that. Still trying on the others. Did it now. Old was 5. Really easy but I didn't pay attention to that level before. I lack the amount of long parts to do this one. Used 8 little ones. But I guess it's not that hard. >> Catapult: 3 parts - Neat. I bet you worked hard at it. I gave up at 4. Did it. Nothing special, just trying over and over again until a good angle is met. Edited by ramses12, 16 September 2012 - 10:43 AM. I do hope you release the source. I am sure many of us would learn a lot from gamemaker by your example. My qomputer with the video files has no internet right now. The network qard is malfunctioning.